qualification is now a mandatory requirement for anyone licensed to drive a vehicle over 3.5 tonnes professionally. Any driver with a C or D class license must undertake 35 hours of approved periodic training over a period of five years. As an Approved training centre, CEI Training offers a flexible, affordable way to secure your Driver Qualification Card, to validate your licence under the new EU legislation. Spread the cost with 5 x one-day courses over five years, or complete your CPC in a five-day course and validate your license immediately on completion. 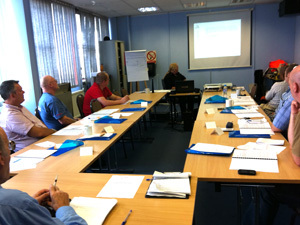 Train at the new CEI Training Centre in Barking, with ample parking, refreshment and catering onsite. Or we can bring our mobile classroom to you. Group and individual rates available. Call, fax or email us for availability & rates.